Last night I got an invite to a super-cool event taking place this Sunday. No, silly, it's not a Marlins game. I don't like the Marlins, and there isn't a Mariachi band playing after the game this Sunday anyway. Another extravaganza? Again, nope. We just did one a month ago, and they will mainly be quarterly (Ed, I'm on vacation the first week in August so don't schedule the next one then!) You'll probably need to wait until Sunday night for most of the details because I have this gag order (and I am no inside leaker, mainly because I like to keep getting the invites). But keep your eyes open. 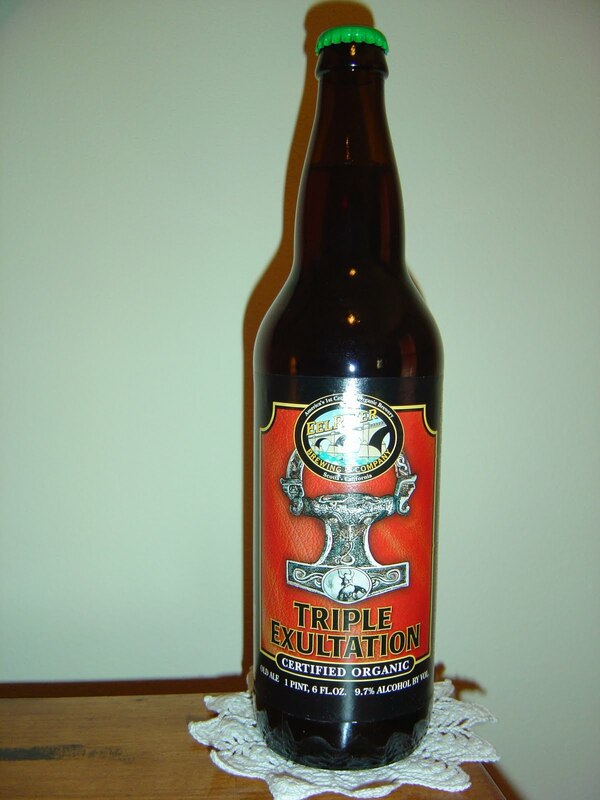 Tonight I'm drinking Triple Exultation, an old ale brewed by Eel River Brewing Company in Scotia, California. As usual, beers by this brewery are organic. The label art has what appears to be a very heavy door knocker as its centerpiece. Fruity, boozy, sweet caramel aroma. Big alcohol up front, extremely sweet with massive candy and sugar flavors. Mango, pineapple and orange are what the 9.7% alcohol is matched with in the beginning. Definitely like drinking a "Jack and Fruit" type cocktail! There are also some sweet caramel flavors, but the sweet is eventually attacked by a bitter component, which drastically thins out the syrupy beginnings. A bit of a roller coaster! Now I can appreciate this beer for what it is, but it ain't my favorite style and it's not even my favorite of the style. Much too boozy for me. I let it warm up... still boozy, though perhaps a little of that edge was taken off. Did they steal that label from Lost Abbey? I have no clue. I don't believe I've ever had a beer from Lost Abbey. Wow, I've never heard of Eel River Brewing before... kind of embarrassed about that being from Cali and all. I'm not gonna lie - you made this beer sound VERY intriguing. What a random assortment of flavors going on. Does it all become disjointed on the palate, and that's why you didn't care for it as much? Or it's just not really your style? Would you recommend the beer to someone who's looking to drink something unique and interesting? I don't know, Royce. For me, I guess, I am getting tired of big alcohol beers where the alcohol does nothing except make me shiver. This was close to that. That is a special re-review of another beer in this style. So I clearly don't hate the style. 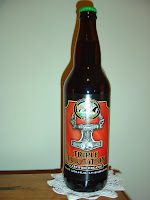 There were good fruity flavors but I guess I wasn't up to Triple Exultation last night.